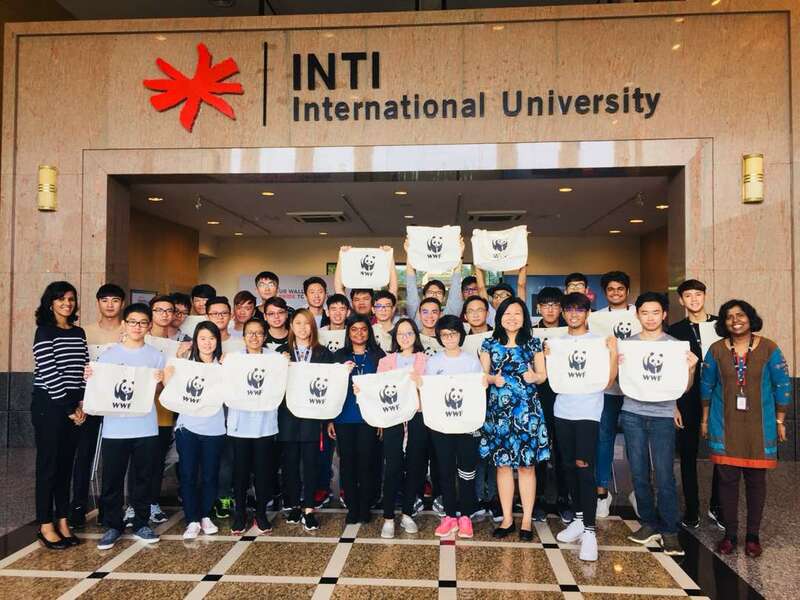 From January to June 2018, the lecturers and students of INTI International University Nilai’s Center of Liberal Arts and Languages (COLAL) added another milestone in their INspiring journey of supporting WWF-Malaysia’s conservation projects. Back in 2014, over 700 INTI COLAL students proved that a truly world class education experience goes beyond just the classroom by successfully raising RM10,658.70 through numerous creative and exciting activities, such as poster presentations and selling recycled materials; all initiated by the students themselves. Following their huge success, the university decided to match the funds raised, thus increasing the donation for conservation efforts to a grand total of RM20,658.70 which was passed to WWF-Malaysia in November 2014. During the kick-off talk in January 2018 for the January to March semester, WWF-Malaysia shared how INTI’s donation helped enable WWF-Malaysia to monitor and patrol nesting beaches to minimise the sale and consumption of turtle eggs as well as conduct research to understand marine turtle habitats and biology, and enhance conservation efforts – thereby ultimately saving thousands of marine turtle lives. With the guidance of their dedicated lecturers: Project Leaders Ms Elizabeth Anne Pereira and Mr Mohamad Faiz Bin Mohamad Ali; Ms Hansini Thedchanamoorthy; Ms Myzatul Zeiha Binti Yusof; Ms Lee Ling Sin; and Ms Phang Siew Sia, the students of INTI COLAL raised RM3,042.35 for WWF-Malaysia’s turtle conservation efforts during the January to March semester. Their carnival in support of WWF-Malaysia’s ‘Save Our Turtles’ Employer Project empowered the students with real world leadership, persuasive communications, solutions oriented thinking, teamwork and interpersonal skills. During their final presentation, the students shared that they enjoyed learning the value of teamwork, and making new friends through this Employer Project, which they felt also boosted their confidence and communications skills. The culmination of the Employer Project was ‘Language Enrichment Day’, when students showcased their creativity, confidence and language skills through conservation-themed competitions. These included public speaking, viral video presentations, acapella singing, essay writing, a spelling bee and a fancy dress contest. Please find the top five essays in the right column. INTI International University’s April Summer Camp 2018 students, with the nurturing guidance of their lecturers Project Manager Ms Hansini Thedchanamoorthy, Ms Kamala Devi Thillainathan, Ms Aileen Anthony Sinniah and Ms Nor Masheera Binti Abdul Manaf, also took up the challenge to undertake the ‘Save Our Turtles’ Employer Project. Through various activities, the Diploma students managed to raise a whopping RM3265.05 for turtle conservation! The 82 students who took part in this project worked very hard to brainstorm ideas that would prove to be fruitful as well as being environmentally conscious. 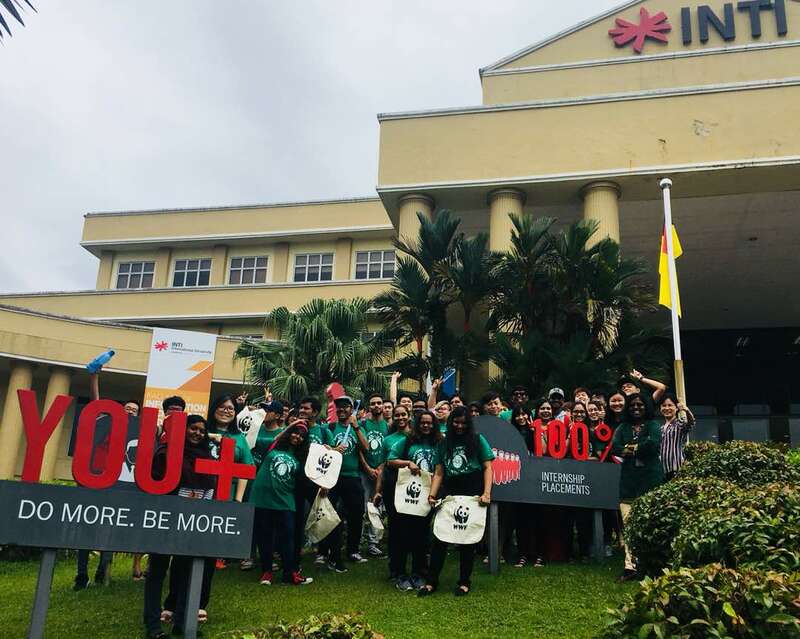 Ideas such ‘Ocean in a Bottle’ that would last forever, taking ‘No More Straws’ pledges and making their own keychains have demonstrated that INTI students’ ideas are never to be taken lightly. They do make an impact in creating awareness and consciousness to protect the environment, and they have raised funds in the most responsible way. “The employer projects have successfully provided opportunities for students to tap their potential and contribute in making the projects a success. They go a long way in helping students develop entrepreneurial and workplace skills, even at pre-university level,” said Associate Professor Phawani Vijayaratnam, Director of the Center of Liberal Arts and Languages, INTI International University Nilai. “I would like to take the opportunity as the Project Manager to thank all the lecturers involved in the April Summer Camp fundraising project and the Language Enrichment Day held on 8 May 2018. Ms. Nor Masheera, Ms. Kamala Devi and Ms. Aileen have been integral in making the events mentioned a success. Their constant encouragement and support have resulted in raising funds beyond our expectations, considering what a small team we had to work with,” said Ms Hansini Thedchanamoorthy. “WWF-Malaysia sincerely thanks the lecturers and students of INTI COLAL for supporting our conservation efforts through the years. We hope that their shining example will inspire other youths to take action to save our living planet, just as their predecessors inspired them,” said Ms Suan Tan, Brand Activation Senior Manager of WWF-Malaysia. The Champion Class students from the April Summer Camp with Associate Professor Phawani Vijayaratnam (far right), Ms Hansini Thedchanamoorthy (front row, sixth from left) Ms Kamala Devi Thillainathan (far left) and Ms Suan Tan (front row, fourth from right).